A dreamer who will transcend his ordinary existence. Where Has the Time Gone? Compiling and Editing. The past two years have been full of emotion, and many new projects developing. Besides either coming up with a new idea or being inspired, part of the fun in writing for me is researching. I become very passionate about a subject that I just can't seem to learn enough about it! But I do what I can with what I have. Compiling and editing research material for a project is like creating a collage. You piece together bits and pieces of the resource material to form a new creature. In this case, I researched the Chipmunk Phenomenon via the Grasshoppers. In this article, I explore the influence pitch shifting had on commercial music for children. Pitch shifting is a sound recording technique in which the original pitch of a sound is raised or lowered to produce, in this case, distinctive animal voices. Vocal tracks were recorded at slow speeds, then played back at normal speeds, giving us the voice of, say, a chipmunk. The Grasshoppers were basically a Chipmunks knockoff. However, their debut album was a good contender for the Chipmunks. I remember sitting in the parlor -- at my spot at the end of the couch -- sitting on the armrest and playing the Grasshoppers album on my Arvin phonograph. And I remember when the album cover split into two. I still kept it, with the record album safely in between them. But then, one day, my mother threw it out. Boy, was I upset! My sister also had some 45's of David Seville and the Chipmunks; "Alvin's Harmonica"/"Mediocre", "The Chipmunk Song"/"Almost Good", and "Witch Doctor"/"Don't Whistle at Me Baby". Looking back now to when I was a child listening to these records, it didn't seem like anything out of the ordinary having two separate groups -- that had similar voices -- perform some of the same songs, namely "Alvin's Harmonica" and "The Chipmunk Song". After all, many groups do cover songs. Then I got to thinking, which came first, the Grasshoppers or the Chipmunks? Or had they come at the same time? I got that answer in 1997 when I met Dr. Demento. It was the Chipmunks, of course. the Chipmunks first officially appeared on the scene in a novelty record released in late fall 1958 by Ross Bagdasarian, Sr., (as David Seville). The song, originally listed on the record label (Liberty F-55168) as "The Chipmunk Song (Christmas Don't Be Late)", featured the singing skills of the chipmunk trio. 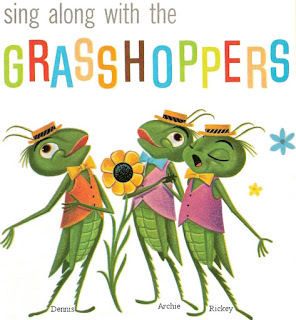 The Grasshoppers released their album in 1959, clearly inspired by this novelty. I'd also look around in used record stores, and later on eBay, for the Grasshoppers. But, for the life of me, I could not remember which album cover we had growing up. Looking at the different cover versions I saw on the internet did not stir my memory either. What I did remember was the grasshoppers' Dixieland straw hats, vests, and bow ties. So I asked my sister. And she said it was the one with the bunnies. I'd like to point out that I do believe that Ross Bagdasarian, Sr. came up with a very clever idea creating the Chipmunks. And those early songs he wrote were ingenious. I don't like the direction they went after his death. But, that's neither here nor there. If it wasn't for that spark of creativity in 1958, there would have been no Grasshoppers. Growing up with the Grasshoppers is indeed one of those memories that I will treasure for the rest of my life. A link to the article and website is below. Sing Along with The Grasshoppers! The Gray Locke Series Has Not Been Forgotten!